A very well-known round from another era, this is the classic loading of the .38 S&W round in a lead round nosed projectile configuration. 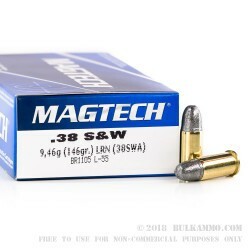 The build of this round is in line with the build quality and condition of most of the firearms that can fire the round and the performance is made to be in line with what the performance was when these guns were popular. This is for a couple of reasons: Firstly, it ensures that even guns that aren’t in top physical condition, but are safe to shoot, remain safe to shoot. 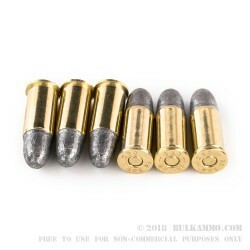 Secondly it ensures that the experience of the shooting with that type of firearm is substantially similar to the experience one might have had as the gun was released new, in its prime. NOTE: This does not mean that because a firearm can chamber a round, that it is safe to shoot. If you are unsure whether your firearm is safe to shoot, have it inspected by a qualified gunsmith or speak with a company representative form the manufacturer of your firearm. 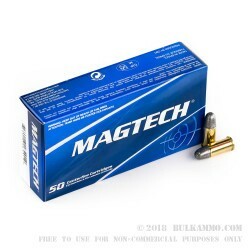 CBC (the parent company for the MagTech brand) is very good at producing this type of round; they recognize that not all shooters are shooting top tier firearms and not all shooters enjoy only shooting more modern higher power calibers or cartridges. Some shooters want classic calibers with classic loadings that are reminiscent of the good old days of the “modern gun era”. The company produces many products throughout its extensive brand collection that fits this need.